One of my favorite people in the world, Mary Lou, who used to be my co-worker, blessed me with this book as she was leaving our company. I was so sorry to see her go, as she was by far one of the sweetest ladies I have ever known. She was always doing for others, and was always positive, with a smile on her face, even as she was leaving, (our company was downsizing). May our Lord continue to bless you Mary Lou, all who know you, can truly see Him in you! 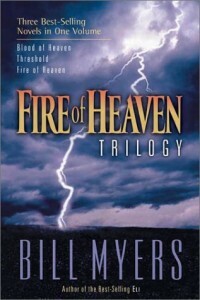 This brings me to the wonderful gift she left me, “Fire of Heaven Trilogy,” by Bill Myers. I have had a wonderful time reading these three books in one volume. 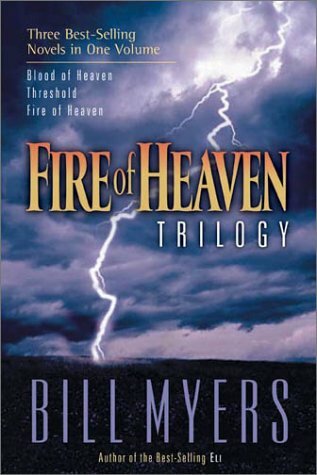 The books , “Blood of Heaven, Threshold, and Fire of Heaven,” are definitely meant to be together, as each one leads into the following one…. “Threshold,” the second book of the trilogy. This story centers around a young man named Brandon Martus, a preacher’s kid, who is typical ornery, but possesses a gift that leads him to become the subject of the Moran Research Institute, led by Dr Helmut Reichner, and his young assistant, Sarah Weintraub, a project in the paranormal. In the final book, “Fire of Heaven,” Brandon and Sarah are now man and wife, Brandon realizing that his power is from God, and he and Sarah are the final two witnesses in the Book of Revelation. The are also reunited with Katherine and Eric Lyons who we met in the first book. All in all, it was an enjoyable group of books to read, a little on the sensational side, for my tastes. I mean, I do love Christian fiction, but in this book, which is my first introduction to Bill Myers, I think he is a very creative and imaginative writer. It’s evident that he really knows his Bible, and if all his works are like this one, I can see the appeal he would have for a world that looks for the paranormal, as the evidence of eternity. I do believe there is a danger in this if it is our only exposure to the Power of Christ, and please know I mean no disrespect to Mr. Myers. I believe that God speaks to us in very intimate ways, using mostly genuine and logical methods. I’m not saying that He doesn’t use dreams, and visions, and lets face it, His Word is full of prophets, and miracles, but it seems like the greatest miracle of all, is the changed heart of a man who comes to know Christ. A man who has spent his life in selfishness ambitions, and upon being introduced to the living Christ, begins to realize his responsibility to the Lord and his own family. That is the miracle of my life. It’s my prayer that people won’t look to the miraculous as the only evidence of a loving Savior, but will look to the incredible experiences that are found within the heart. This is a fun book to read, and like Frank Peretti’s books, these type of work offers a look into the fantastical aspects that can surround those that are following Christ. Other books like the writings of Brock and Bodie Thoene, “The A.D. Chronicles,” offer us glimpses of our Christian heritage. All genres are needed and very much welcome. I hope kind reader, that you are a believer. If not, please read this book then sit down with a trusted and loving friend and discuss any questions you may have. Please, above all thing in this life, know Christ. He already knows you and and is waiting for you to reach to Him.